Ten years ago, two children witnessed a murder that still haunts them as adults. Now a chance meeting brings these two strangers together to uncover the secrets of a kingdom and evil that will throw the land into chaos. 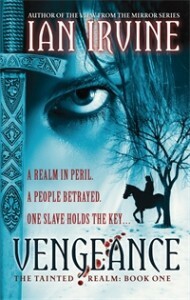 VENGEANCE (US | UK | AUS) is an epic tale of revenge and redemption from Ian Irvine, one of fantasy’s finest storytellers. Read an excerpt from the first book of The Tainted Realms series. Wil, who was neither handsome nor clever, knew that Ady only kept him around because he worked hard. And because, years ago, he had revealed a gift for shillilar, morrow-sight. Having been robbed of their past, the matriarchs used even their weakest tools to protect Cython’s future. Though Wil was so lowly that he might never earn a tattoo, he desperately wanted to be special, to matter. But he had another reason for wanting to look at the Solaces, one he dared not mention to anyone. A later shillilar had told him that there was something wrong, something the matriarchs weren’t telling them. Perhaps—heretical thought—something they didn’t know.